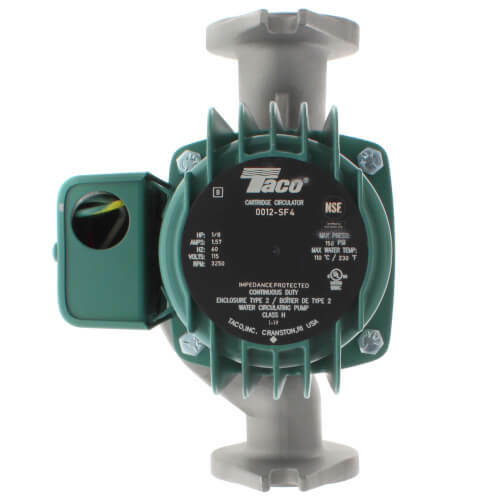 The Taco 0012 is specifically designed for high flow / medium head applications in large residential and light commercial systems. Ideal for large BTUH Boilers, 2" recirculation loops, Primary/Secondary loops, commercial water heaters and light commercial heating and cooling systems. The Bronze or Stainless Steel 0012 can be used on open loop systems. The unique replaceable cartridge contains all of the moving parts and allows for easy service instead of replacing the entire circulator. Universal flange to flange dimensions and orientation allows the 0012 to easily replace other models. Compact, low power consumption design makes it ideal for high-efficiency jobs. The 0012-F4 is a direct replacement for the HV Series and the 0012-F4-1 is a direct replacement for the 2" Series using existing flanges.